ProPlant Complete Shake by Gundry MD Reviews - Is It a Scam or Legit? Gundry MD advertises their ProPlant Complete Shake as a worry-free way of maintaining energy, managing unhealthy cravings, and supporting a healthy heart. Together, the company claims you’ll experience improved energy, reduced cravings, increased fullness after meals, stronger muscles and bones, a more balanced mood, boosted energy, and supported heart, brain, and eye health. The Gundry MD website advertises you simply need to mix two scoops of ProPlant Complete into the beverage of your choice and enjoy. When consumed regularly, we’re told most customers report a different within a few days, while for others it may take two to three weeks. Can you really achieve all of these benefits—including weight management and whole body health—by drinking a once-daily shake like ProPlant Complete? This is the central question we’ll help you answer in this article. In addition to carbohydrates and fats, protein is a macronutrient that Neil Osterweil explains is broken down by the body into amino acids. Then, these amino acids are used by every cell in the body to “build and repair tissues” and to “make enzymes, hormones, and other body chemicals.” They’re also “an important building block of bones, muscles, cartilage, skin, and blood,” he says. Based on the current Dietary Reference Intake (DRI) guidelines, Healthline reports the average sedentary woman needs about 46 grams of protein per day, while the average sedentary man needs about 56 grams per day. This is where powdered dietary supplements like ProPlant Complete come in, by boosting the amount of protein available to the body. But, is the fact that it’s plant-based an advantage? A different Healthline article reports that, compared to animal-based protein (such as whey), plant proteins are typically incomplete, in that they don’t contain all of the amino acids necessary for muscle rebuilding, etc. So, from a sheer biological perspective, animal-based proteins most closely match what’s found in your body. On the flip side, Kedist Tedla at the American Council on Science and Health reports that food-based animal protein sources (especially processed meats) can significantly increase a person’s risk of mortality. However, much of this concern is alleviated when it comes to protein powder supplements since many of the harmful substances are no longer present. Protein 20 g, Thiamin 0.6 mg, Riboflavin 0.2 mg, Niacin 4.6 mg, Vitamin B6 0.3 mg, Folate 82 mcg, Calcium 140 mg, Iron 11 mg , Phosphorus 585 mg, Magnesium 420 mg, Zinc 5 mg, Copper 1.2 mg, Manganese 3 mg, Sodium 190 mg, Potassium 600 mg. Important: You’ll notice there’s no protein source listed above (other than the fact that it’s obviously plant-based). None of the Gundry MD customer support reps we spoke with during our research could provide additional insight and only stated that it’s proprietary information. Nonetheless, we already discussed that your protein needs depend on important factors like activity level, age, muscle mass, physique goals, and current health. It’s much the same with many of ProPlant’s other ingredients, which are often dosed based on age and gender. From a high-level perspective, though, each of these ingredients represents between about 10% and 200% of the daily dietary reference intake (DRI) for adults. As a result, to ensure you’re not ingesting too much on a regular basis, be sure to have an in-depth conversation with your doctor, who might need to order the appropriate blood work in advance. Could Gundry MD’s ProPlant Complete Cause Side Effects? How Much Does ProPlant Complete by Gundry MD Cost? All orders come with free shipping, as well as a 90-day money back guarantee, less return S&H. Customer support can be reached at (800) 852-0477. According to Grand View Research, as of 2016, the global protein supplements market was valued at $12.4 billion, which they estimate will show “significant growth” through 2025 as a greater number of consumers continue adopting healthy lifestyles. As a result, it might not come as much as a surprise that there are perhaps thousands of different protein powder formulations available online, as well as at just about any brick and mortar store with a supplements section. When searching for one, Bodybuilding.com’s Clayton South recommends focusing on options that include essential amino acids like “tryptophan, lysine, methionine, phenylalanine, threonine, valine, isoleucine, leucine,” as well as a mix of branch-chain amino acids (BCAAs). Clayton points out that the protein source is important as well, especially when it comes to plant-based supplements. Why? In most instances, plant protein—whether ProPlant Complete or a third-party brand—is considered incomplete, since it doesn’t contain all of the essential amino acids found in animal-based sources. For example, Healthline explains that brown rice protein is generally considered an inferior source, since it’s “too low in lysine,” as is hemp protein. On the other hand, pea protein “has been shown to promote fullness and increase muscle growth as effectively as animal-based protein sources” in limited studies. As a result, if you’re looking to gain muscle or lose weight, they point out that whey or casein protein powder might work best. On the other hand, vegetarians and vegans focused on plant-based options might want to explore those that include a variety of sources, including pea. Do they support their claims with clinical evidence? Do they stand behind their supplements with at least a 30-day refund policy, with reasonable S&H charges and no restocking fees? Do they come with mostly positive online customer feedback? Is Gundry MD’s ProPlant Complete Shake the Right Option for You? Gundry MD has been in been in business for several years and has released many popular supplements in that time, including Vital Reds, Primal Plants, Prebiothrive, and Total Restore, to name just a few. They also come with exceedingly high customer reviews, here on HighYa as well as elsewhere online. The company stands behind ProPlant and all of their other supplements with a 90-day money back guarantee (less return S&H charges) and no restocking fees. It’s important to balance these positives with the fact that we’re not told what the supplement’s protein source is, despite several calls to customer support. So, depending on your preferences, it might not contain all of the essential amino acids you need. Finally, at as much as $112 per jar (about $5.60 per serving), if ordered from the main Gundry MD site, ProPlant Complete is the most expensive protein supplement we’ve encountered to date. As a result, if you’re going to place an order, we’d recommend doing so from their TheProteinParadox.com URL, which offers significantly lower prices. I love the effect, but when I mix the powder with room temperature water, and shake it, it turns into a nasty slimy mess that is so awful I can't swallow it. I had better results by using chilled milk, only stir with a spoon, and then drink it without emulsification. Hi John, I'm sorry to hear that this was your experience with our ProPlant Complete Shake. Some of our customers have seen success using a blender bottle to help dissolve the powder. If you ever have any other questions or are dissatisfied at any time, please email me at aria@gundrymd.com and I'd be happy to help. I've been very pleased with taking this supplement. I've used it as a meal replacement as well as a gut restorative supplement. Gut feels a lot more relaxed with a very nice sense of well being. It tastes very good and I always look forward to taking it...once a day mostly, but sometimes twice daily. I am currently on my second container of ProPlant. I drink it every other morning and I find it to be very satisfying. I recently had my labs done and the results were very satisfying to me. I am continuing to work on my goals, since January 2nd I lost 15 pounds and labs with great improvement. I will definitely refer you and your products. When I first began using the shake, I added spinach, strawberries, blackberries, grapes, unsalted pecans, cashews, almonds, and pistachios. I had to keep adding more water because the shake was way too thick. I finally stopped adding all these extra fruits, but still add more water than recommended. The chocolate taste is really great. I don't like eating breakfast and have enjoyed a shake for over 25 years. Yours is the best I've tried. I was originally concerned about how your product would agree with my digestive system. No problems. Great tasting, agrees with me, and I feel great. I would highly recommend this shake to anyone. 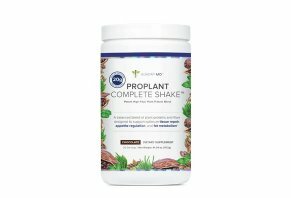 I love the ProPlant Complete Shake! Many protein shakes have a terrible after taste. Whey and especially pea powder are horrible. This one tastes yummy and I use it for lunch most days. I would recommend this product to anyone who wants a great tasting shake. I have not noticed much of a difference in energy or other wellness results with this shake, but I'm not finished with the container. Five days a week I have a shake for breakfast. I usually get plain flavored shakes because I like to add blueberries, ground flax seeds, and chia seeds to my morning shakes. I'm pretty finicky about chocolate flavors. The chocolate flavor of this shake is okay, but not as enjoyable as the other plain flavored shakes I usually purchase. Does it come in any other flavor besides chocolate? I wish I could say that the healthy benefits of the shake were more beneficial than my other shakes, but I truly can't at this time. Maybe by the time I finish the container, I'll notice a change. I do believe the ingredients are very good though. I'm undecided at this time about whether I would recommend this product to a friend, but since the choices are yes and no, I'm going to have to honestly choose no at this time or at least have a caveat in my recommendation that I'm not fond of the flavor. Hi Jean, thank you for taking the time to leave a review! At this time, this shake is one available in chocolate, but we take our customer feedback to heart so I will be sure to pass along yours to our Product Development team. I encourage you to continue taking our ProPlant shake, but if any time you are dissatisfied or unimproved, please email me at aria@gundrymd.com and I'd be happy to issue you a full refund. Dr. Gundry, I love the taste, it’s filling enough and I get good results from diminished cravings. I would love to see it in vanilla as well. I enjoyed the recipe of adding avocado, spinach, and ginger. I had been adding flaxseed and chia to my shakes. It’s great to have a formula that incorporates the flaxseed already and had a rich source of protein and fat already. It’s cheaper and less time-consuming. The convenience of having a formula where I don’t have to add a lot of stuff was a factor for my purchase. I will try another three bottles. Hope I see vanilla in there but if not the chocolate is delicious too. My digestion was 100% better in terms of regularity. I felt more energy and much less tired. The taste and consistency are wonderful, and I mixed in berries and spinach and bananas and it was delicious. I can’t say enough positive things about Dr. Gundry’s product. I have had ProPlant for a brief time and manage one shake every other day, two every three days at best. I add the Vital Reds, and Energy Renew as well. I've tried fruit and it was a taste disaster to my palate. The chocolate taste is not to my liking and I would much prefer a more workable vanilla. Having no stomach or GI problems or complaints and with the other additions I love the pick me up energy I experience daily...just not as palatable as I had hoped. I could only recommend this to a real chocolate lover, and while I like chocolate, this shake would be more suited to me as vanilla! I will, however, continue with the product. Hi Gerald, thank you for sharing your feedback! I'll pass along your notes to our Product Development team. If you have any questions or concerns in the future, please email me at aria@gundrymd.com and I'd be happy to help! Today I tried this for the first time. Although I do like chocolate, I would prefer vanilla. A little hard to really enjoy the taste of this chocolate but I will let you know I feel after a week. I have been using the shake and a trainer created the meal plan for. Week #5 now and I am so excited. I'm at 18 lbs lost and learning the measuring of food that I really needed, which I was totally aware of, that was my problem, just had to go with it and do it. Best ever, thanks. Write a Review for ProPlant Complete Shake by Gundry MD!